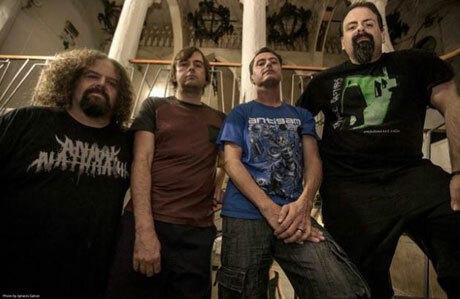 UK grind gods Napalm Death have finally unveiled some new material from their forthcoming Apex Predator - Easy Meat, blistering through the "Cesspits" with a masterful and menacing melange of nihilistic howling and destructive beats. Napalm Death juggle a number of heavy styles into the three-and-a-half-minute arrangement, from the steady chug of punky power chords and more math-tacular rhythms of the front end to the high-speed damage delivered in a thrashing back half. Leading the charge are Barney Greenway's lovingly gargled cries, while the tune is rife with gut-ripping guitar riffs and jack hammer drum blasts. You'll find the chaotic track down below, courtesy of Decibel. As previously reported, Apex Predator - Easy Meat comes out January 27 through Century Media, with the group's North American tour with Voivod starting up the same day.